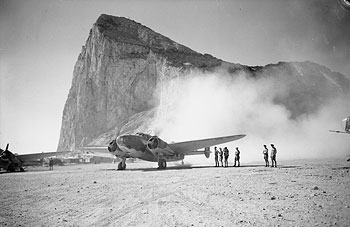 Gibraltar Airport or North Front Airport (IATA: GIB, ICAO: LXGB) is the civilian airport that serves the British overseas territory of Gibraltar. 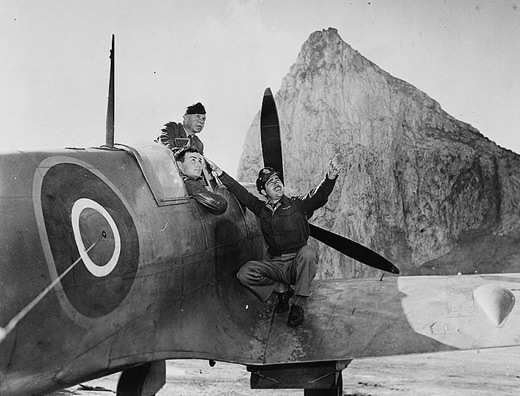 It is owned by the Ministry of Defence for use by the Royal Air Force as RAF Gibraltar. Civilian operators use the airport; currently the only scheduled flights operate to the United Kingdom and Spain. Passengers depart and arrive through the civilian operated terminal. 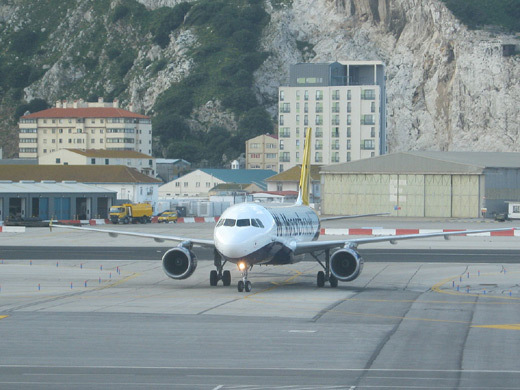 Gibraltar Airport has the distinction of being the closest airport to the city that it serves, being only 500 metres from Gibraltar's city centre. In 2004 the airport handled 314,375 passengers and 380 tonnes of cargo. Gibraltar Airport is one of the few Class A airports in the world. 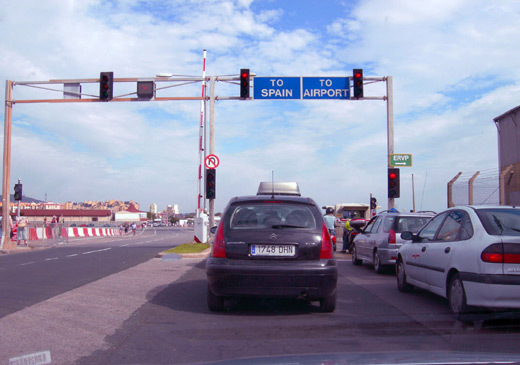 Winston Churchill Avenue (the main road heading towards the land border with Spain) intersects the airport runway, so consequently has to be closed every time a plane lands or departs. The History Channel program Most Extreme Airports, ranks it as the 5th most dangerous airport in the world. EasyJet is the only one currently flying to London Gatwick with 7 weekly flights. Monarch Airlines currently operates seven flights weekly to London Luton and three flights weekly to Manchester Airport. 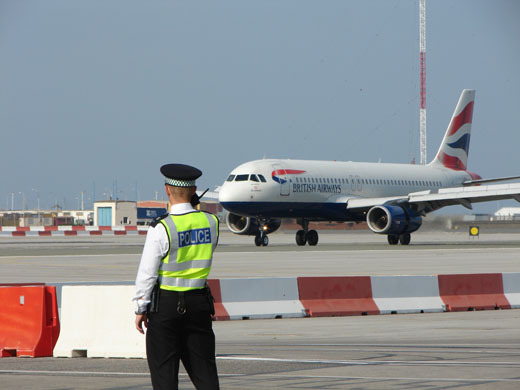 British Airways also flies seven times weekly into Gibraltar from London Heathrow. 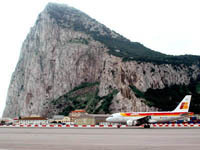 In April 2009 Ándalus Líneas Aéreas restored Gibraltar's airlinks with the Spanish capital. In July 2009 Ándalus also began scheduled flights to Barcelona, increasing the destinations in Spain to two. However, the airline ceased to serve this route in September 2009 due to a lack of demand. In April 2010 it was confirmed that Ándalus flights to and from Gibraltar had been indefinitely suspended. And now yet again, Gibraltar has no direct air links to Spain. 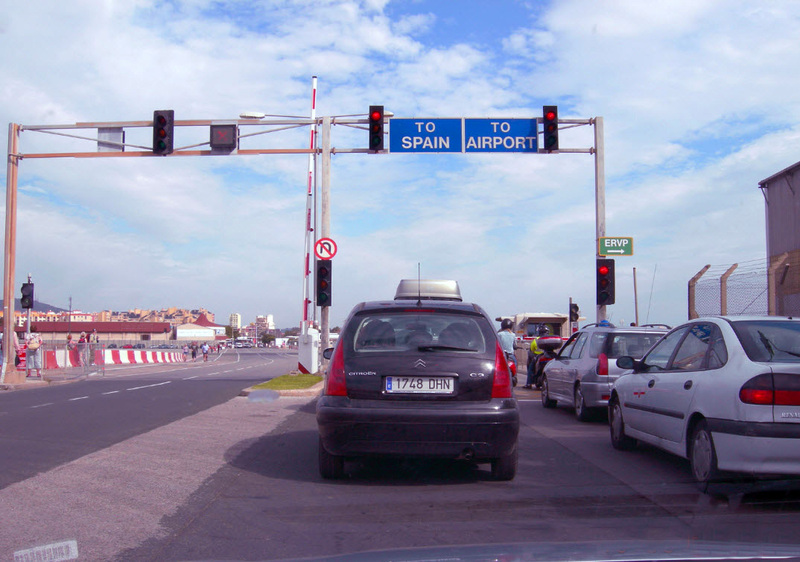 The existing terminal at Gibraltar Airport has been, for many years, too small and the road across the runway is even more constraining to operations at the airport, especially with the increase in operations since the Córdoba Accord. Prior to this agreement, only three flights operated daily to Gatwick and Luton, and three flights a week to Manchester. On busy days at present some 7 flights now arrive and depart. If the average time the road is closed for an aircraft to land or depart is 10 minutes, then on certain days the road can be closed for over two hours. Construction of a new 20,000 m (220,000 sq ft), two storey terminal, 15,000 m (160,000 sq ft) larger than the terminal it replaces. The new terminal will straddle the new road system, will have 4 gates, 3 baggage carousels and passenger capacity of up to one million per year. 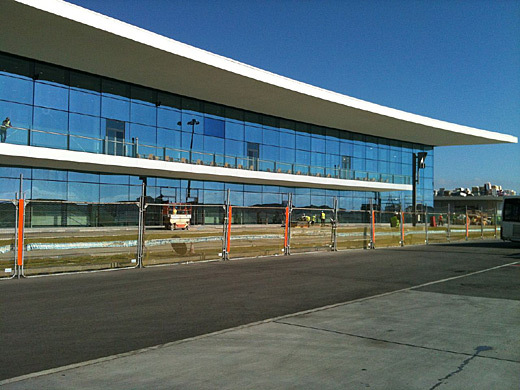 Construction of the new terminal was due to begin late in 2007 and be finished by 2008. However, this has been delayed. 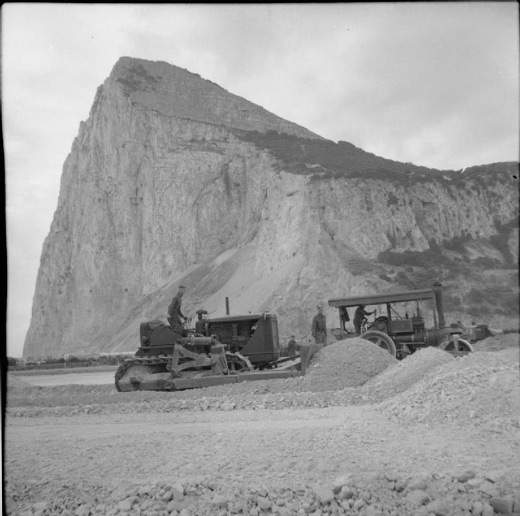 Construction of the 4 lane diversion road and tunnel section was due to begin in January 2008 and be completed by the beginning of 2009. However, due to the delays, it is now expected to open in 2011. There will be no disruption to operations during construction as they are not built on the same site. The new terminal will allow a large increase of capacity, and the runway tunnel will reduce delays and tailbacks caused by aircraft taking off and landing. 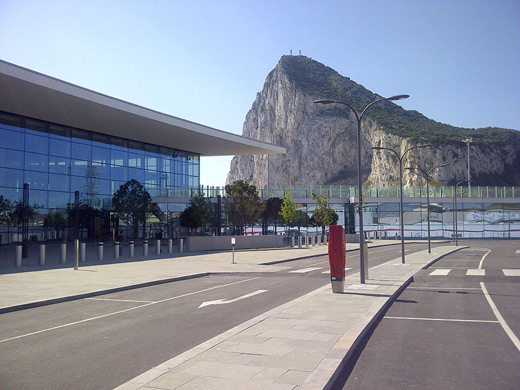 Gibraltar Airport - Panoramic photograph of Gibraltar International Airport, with time-lapse showing an aircraft take-off. Gibraltar Airport - A Monarch Airbus A320 taxiing to the gate. CAUTION FNA to Rwy 27 offset 10 lt. Visual decision pt for Rwy 09 is on a nstd base legand rqr an immed rgt turn of 10 to estab on the RCL. Exp turb on FNA to Rwy 09-27. See FLIP ES Section D for details. Exp QFE altimeter settings. Due to unregulated airspace around afld, possibility of unk acft in the immed vcnty. Yachtsopr fr marinas N and S of W end Rwy 09. Bird haz. Due to concrete security barriers near apn entrances, acft shall strictly flw twy cntrln on apns. LGT PAPI Rwy 09/27 MEHT 31'. MISC Ctc APP CON 50 NM out. To avoid damage to rwy sfc, B737/A320 and larger acft ldgRwy 27, cont to rwy end and make 18 turn at Rwy 09 thld. No designated turning cir at Rwy 27 thld. Main road cros rwy at mid-point. ATC req 3 min PN to clear veh and pers. RSTD Radar svc mand, see FLIP ES Section D for details. Mil arr 0700-1500Z++ Mon-Fri,mil dep 0800-1600Z++ Mon-Fri. Ctc ATC NLT 15 min before eng start for clnc. No eng start before 0700Z++.